In April 1947 a log cabin, formerly a diner, and some four acres were purchased to establish a Catholic Mission, St. Ann, for the community of Williamsburg, Ohio. To prepare the log cabin for the celebration of the Mass, parishioners added pews and fashioned a simple albeit beautiful altar, and on October 12, 1947, Mass was celebrated for the first time by Monsignor James Hoban. The current church was completed in spring of 1959, and is designed in the Colonial American style. 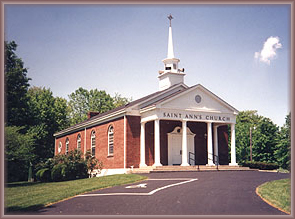 In 1990 St. Ann church began to share a pastor with Holy Trinity parish in Batavia, Ohio. In July of 2012 the four parish region of St. Ann, Holy Trinity, St. Louis, and St. Philomena were gathered together under the name of Clermont Catholic Communities. The overseer of this process and the pastor of this new four parish region was Fr. Jerry Hiland, who up until that time had been pastor of St. Louis and St. Philomena. The current pastor, Fr. Martin Bachman, was assigned to the parish region in 2015. Fr. Andrew Cordonnier was assigned as the region’s parochial vicar at that same time.